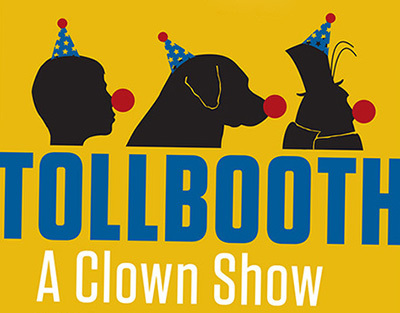 First Floor Theater, of which second year media student Sid Branca is a key member, presents Toolbooth: A Clown Show, running through May 18. Tolllbooth takes place in the Humboldt Park Field House, Thursdays & Fridays at 7:00 p.m., Saturdays (except May 10) at 3:00 p.m. & 6:00 p.m., and Sundays at 3:00 p.m.
Tollbooth was devised/directed by Will Bishop and Scott Ray Merchant, and features Kyle Geissler, Katelin Healy, Alexander M Knapp, Shaw Nigro, Tim Martin, Chris Mueller, Kasey O’Brien, and Angelica Roque. The production team includes: Autumn McConnico (Stage Manager), Jackie Valdez (Set Design), Molly FitzMaurice (Dramaturgy), Amanda Cantlin (Light Design), Bobby Huggins (Sound Design), Alexis Chaney (Costume Design), Dav Yendler (Puppet Illustrator), Grace Needleman (Puppet Designer), Evan Garrett & Myra Su (Shadow Puppet Designers), Cara Feeney and Ellie Terrell (Toy Theater Designers), Kelsey Just (Scroll Designer), John Szymanski (Composer), Andrew Rovner (Technical Director), and Markie Gray (Production Manager).